Dogged Blog: How Long Do Dogs Live? How long do dogs live? Not long enough. He told me this when he called to say I didn't have to work today, even though I didn't work yesterday, either. That was because yesterday, I took my beautiful Raven on her last journey, the one dogs don't come back from. When they have trouble breathing and stop eating, any idiot knows it's time. Some people might think I'm an idiot to love my dogs the way I do, to have taken this fight as far as I did, but I'm not too much of an idiot to know when I've been beaten. I don't regret fighting for Raven's life - not the chemo, the Chinese herbs, the experimental inhaled interleukin-2 and IV pamidronate. I just think it was all too late. Helen, her vet, said she had a nasty aggressive osteosarcoma, and it tore through my girl like wildfire. I've never had an animal with cancer before. I know now why so many people call it The Beast, although it seems Raven's cancer was among the most beastly. Despite that, it gives me some comfort knowing I did everything possible, and a few impossible things, too. I definitely don't regret the amputation. Every day after I brought her home from the surgery was better than the day before. Every day she exceeded my expectations of her recovery. Stairs, hills, even chasing a jackrabbit - my girl had some golden weeks in this unexpectedly cool and foggy summer. I just didn't know how short our post-amputation honeymoon would be. I don't regret making Raven part of my life, either, despite the way it ended. 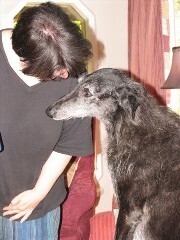 I remember picking Raven out of her litter, a sleek black puppy in a sea of grey. I had just had a disappointment when a litter I bred turned out to be one male puppy, and I bought Raven originally expecting to breed her to my dog Doughal when she grew up. 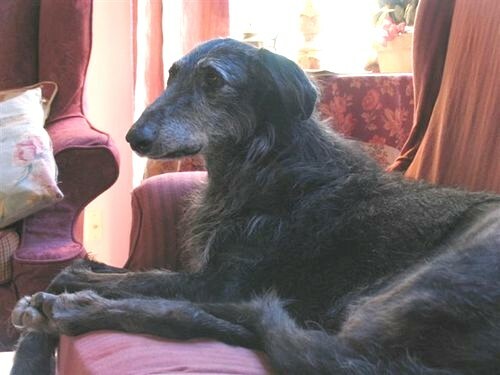 It wasn't to be, as she turned out to have severe allergies, and considering osteosarcoma is a genetic disease in Scottish Deerhounds, that was a blessing in disguise. I'd cut my own arm off before I knowingly produced puppies who might put their owners through what I've just gone through. But regret having her in my life? Not hardly. Because I loved Raven like nothing else, with more fire than the one that burned through her, with more joy and hope and love every morning, when she opened up her eyes and looked at me. How long do dogs live? They live forever. I'm so so sorry to hear of Raven's passing. I have been following her progress for a while and I hoped that she would be able to stay longer... I know what your boss means. 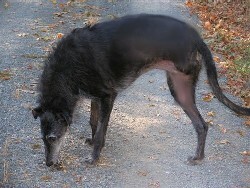 I haven't even lost our dog; he's just getting older and has some health problems that worry me. Sometimes I do think that the only new pet I want is something that will outlive me and not really miss me much when I'm gone. It just seems wrong that such gentle loyal loving joyful creatures should spend such a short time on earth and too often be abused or neglected. There are times when I wish I had not opened my heart so much to this furry orphan of a dog but it's too late now. Knowing we give them a great life is a little consolation for the heartache they inevitably bring at their passing. That and knowing that they KNOW you love them. I'm so sorry, Christie. Raven is just beautiful--and for you, surely, she is forever young. I just wanted to send you my most deepest of sympathies. I can relate to your agonizing pain - the way many other true dog lovers can. We have spoken in the past about our dogs, their health, our deep love for them etc. Your love for Raven sounds like the love I have for my current Rhodesian Ridgeback, Izzy, also a severe allergy-sufferer and now 8 years old. I lost my first Ridgeback, Dempsey, to osteosarcoman in January of 1999. Back then we saw an Oncologist here in NJ, and the only thing he could offer us was a very strong dose of chemo which did not work. Amputation was not an option, his tumor originated on his rib and grew inward. When he died, he was just 22 months of age. It is indeed a horrifying beast - osteo being the worst. We lost our English Pointer back in March, to lymphoma - but we were able to treat it with chemo and keep it at bay for 9 months - fastest 9 months of my life. absolutely stunning and her sweetness was evident in those gorgeous eyes filled with such soul. Rest in peace Raven - until you are reunited with your Mom. Raven is beautiful, and so are you Christie. Much love to you and your furkids. Be comforted... many of us have angels at the bridge... Raven is in good company. My hear goes out to you for your loss of beloved Raven. I struggled along with you both as I read your blog and pulled for Raven to have all those wonderful days with you and many many more. I know Raven is in good company where she is now, but I know all too well how hard a decision it is to make when the best thing to do for your friend is to let them go, that one last time. They live on in hearts and memories but it's so hard to be the one left behind. HUGS Christie! How brave you and Raven have both been. You were there to take her home each time. Canine or human, cannot ask for more than a loving hand. You gave that, and love everyday. 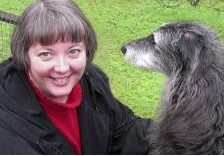 You and your 2 & 4 legged family are in my thoughts as I bid Raven adieu. Thank you for sharing her journey with so many of us. Christie, I just read your post and my heart and prayers go out to you. I rem. the very beginning and you both fought a very courageous and loving battle. I admire both you and Raven and thank you for letting us be there to cry, to learn and to "PUSH", hoping to make the jouney a little easier. Gather the memories and never let go, they live forever too! Cancer is The Beast and too many of us understand that whether from human experience or canine.One of the hardest times of my life was nursing Junebug through 6 months of hemangiosarcoma but it was also one of the sweetest because we developed a bond that was deeper and more lasting than I could ever have imagined. I wish for Raven a peaceful journey and for you the knowledge that you did all you could for her at that she will live forever in your heart. Some dogs just get into your heart. Obviously, for you Raven was one of those. Condolences. As you say, she'll run forever in your heart. Oh, I am so sorry. As you said, no regrets. Raven was lucky to be part of your life. Best wishes from Ohio. I am so sorry for your loss. My thoughts are with you. I am sorry for your loss …. How quickly the time passes...when we are given unconditional love by another who is blind to our human faults and frailties. God was wise when He gave us Dog. He gave us a 'mirror' to what we should be....loving, faithful, protective, funny, forgiving, graceful and giving without expecting something in return. Enjoying the simple pleasures of those around them and reveling in the sheer beauty of life itself. Hope the coming days are gentle reminders of the memories you all shared. I believe that my spirit dogs are with me always and just out of my vision...never out of my heart. "A Ridgeback isn't just another dog....It's a Lifestyle!" I am so sorry. This is the sweetest post I've ever read. I'm shaking. Yes, I did mean that word. Your sharing your Raven in this way, at this time, is just so terribly sweet. Christie, I am so sorry to hear Raven made her final journey. I know how difficult it is to say our final farewells. Raven will live on in your heart. Christie my heart aches for you, I know how hard losing a cancer dog is. We question, we get angry, and then we cry. After we finally pass through these stages we can remember our loved with such a ferocity it boggles our minds how we will ever go on without them. I myself have found the answer to this question. Our hearts don't heal but they slowly mend, the rips in them begin to close as our other pets heal the fabric with their constant and unwavering love they give to us at all times. Your heart will sing again just as Raven's heart is now singing for you. My heart goes out to you in your loss of Raven. I lost my beloved Molly to osteosarcoma 1 year ago. We also made the same decisions as you..amputation/chemo/chinese herbs. We were blessed to have two more years with her and she developed another type of cancer in a front leg. I'm sure her and Raven are running around together, four legged, and sharing their stories about how much their parents cared for them and how much they were loved. I was truly touched by this article in "Fetch". My husband and I just went through a similar situation where we had to put our beloved Kaila to sleep due to osteosarcoma on 9/21/05. We amputated her leg 8/13/04 and decided not to give her chemotherapy. We had a little over 13 months of extra time for love and kisses. She was such a loving and beloved friend to us. I can understand how you must feel. We are still trying to deal with out loss. She was a beautiful Siberian Husky. But I have to remember that I have two other Huskies at home who need our love and attention. My youngest male who is only 3 is having a very hard time. I have never seen a dog mourn before. Again, thank you so much for sharing your loss. i think that you should love your dogs as long as you can! Christie, I know this is a response to an old blog entry but grief stays fresh for a long time. I still see my corgi, Patrick, around corners even though he has been gone for a couple of years. Dogs do live forever. So I just wanted to say how much I appreciated your story of Raven. I am very sorry for your loss. I just found your site. It is very inspirational. My friend Bill and I (Bill is my pal - 160 English Mastiff) are going through some trials. A failed surgery has left Bill paralyzed with his right rear leg and I have been searching for comfort - advice - anything that can temper the feelings of guilt that I have. We are working hard (PT, acupunture) before the amputation day that is looming much too quickly. This site has helped me in my search of what is best for Bill. Thanks. Christie, I followed the link over to this from your post today, and I don't know what to say. Your love for your dogs is so moving and I don't even have one. I'm sorry for the repeated hits your heart has taken with your loss of Scarlett this week following on the heels of losing your Raven last year. I'm truly weeping for you. hi i had a dog that was older than my daughter (20)she is 14. we had to put her to sleep. so we know what you're feeling. awww i am very soory for ur loss i have two dogs ones old now hes bout the same age as me (14) n im dredding the day he passes away but i try not fink of tht n jst enjoy tkaing him on his walks i look at him all the time n fink of the first day wen i had him the years have gone by so quickly n i wish tht they lived forever i think that u have produced such a great story n raven looks so cute on thos pics hes got such a great face n by the loks of it he seemed to have had a great life im crying as im writing this and like u sed how long does a dog live n the real answer is forever. raven had such a great life and i bet he is still having a fab life in heaven wiv all the uva dogs n i bet he will wait there until u meet agen u shall meet one day wiv him . god bless and rest in peace raven and play wiv the uva dogs up there. I'm so sorry for your loss. I know it happened a while ago now, but I lost my "heart" dog Bella 4 years ago, and I know how long it can take to come to terms with a loss like this. I had Bella for 14 years, my entire adult life, and from the time of her diagnosis to her passing were the hardest three months of my life. Well, 6 months after losing her, I felt it was time to try and fill up the hole in my life. I went to the same shelter where I found her almost 15 years earlier, and in the same kennel I found what I termed my "replacement" dog, Bunny. Bunny is a shepard mix, and over the last 3plus years I have grown to love him dearly. I travel quite a bit, and it was just under a month ago when I received a terrible phone call from my dogsitter. Bunny had been limping, so he took him to the vet, who was now on the other end of the line telling me about osteosarcoma. I cut my trip short came back home, and now, today, am waiting for the phone call to come pick him up after his rear left leg amputation. I found your blog about Raven while searching for information on nutrional and holistic therapies I can try in addition to his chemotherapy. I am now where you were post amputation...hopeful, but realistic. I am typing this through a veil of tears as the realization that he most likely won't be in that small percentage that gets a full remission. The three leggedness never bothered me. I've seen three legged dogs my entire life, just as happy and running around as the other dogs. I want to cure my dog. Just like you. Just like anyone who loves their pet. I want him to be with me forever, or as much of forever as I can get. I have been serching for additional therapies and haven't been very successful finding anything that seems to have had an effect. I would be very interested in getting more information about the interleukin study, if you still have it. The vet just called, I can go pick him up at anytime now. And so I now start those up and down days that you described so well, that I remember all to well from Bellas' last days. The amputation was the easy part. This is the hard part. Thank you for telling Ravens story. It is one that is unfortunately lived by so many others. i lost meeko on july 25 to hemangiosarcoma - she would have been 11 1/2 in august - on july 4 she was the fastest dog at the dog park - then suddenly she had these growths which were removed on july 9 - on july 12 i got the bad news - i at least had 13 days to spend with her, 3 not so good but before her death 8 awesome days including a 3 day camping trip where she chased balls in the water and hiked - she was not feeling good the morning of the 25th - we thought another down day - i went out and returned at 11:45 am - she was trying to greet me at the back door when she collapsed - she deterioated from there - at 3:15 we noticed her tongue was gray and her paws cold - she died in my husbans arms (all 75 ppound of her) on the way out to the car to take her to the vet for euthansia - we dug a grave which i carried her to - she was buried with as many of the balls she had collected at the dog park that i could locate and the treat she didn't eat that morning - i got her when she was 6 weeks old - a few months before her bloodwork was that of a dog half her age - she was taken lopng before her time should have been up - i'm not sure when i'll ever be really happy again - I hate that cancer!! !